Shop Knowledge center Crop Care Powder and liquid shading agents | What is the difference? What are the differences between powder and liquid shading agents? Since the 1970’s developments in the horticultural sector have increased rapidly. Developments in areas such as production engineering, automation, overall professionalism, marketing and, last but not least, greenhouse technology and construction. As greenhouses grew bigger and taller, gutters grew longer and thinner and spraying techniques became more sophisticated. With these developments the demand for a different way of ‘chalking’ also grew louder. It needed to be easier, faster, safer and more accurate. From this demand liquid shading agents have arisen. The main difference between powder and liquid shading agents is their composition and obviously their form: powder shading agents are fixed and liquid shading agents are…liquid. This results in liquid shading agents not only being easier to mix and dose with water before applying, they are consequently also much more weather resistant than powder shading agents are. The latter therefore allows for differences in their application and deployment. Because liquid shading agents are more durable in rainy weather conditions liquid shading agents are mostly used in regions with rainy climates, such as Northern and Western Europe. Powder shading agents are consequently deployed in regions with dry or drier climates, like the Mediterranean region. However, powder shading agents are also frequently used in rainy climates. When only a short period of shading is necessary, for example when a few days of tropical weather/temperatures/extreme temperatures are predicted a powder shading agents can also do the job. One thing both powder and liquid shading agents have in common is their ease in removing. Whereas powder shading agents will slowly and completely wear off through elements of weather, liquid shading agents are just as easily removed by spraying with a shading agent remover, Removit. This is because liquid shading agents contain a patented binder for adhesion which needs to be dissolved. The final difference between both shading agents is their price. Liquid shading agents are more expensive than powder shading agents are, but the higher price pays off in quality and easiness: more convenience when applying or dispensing, a much better weather resistance and longer lifespan. Any questions about the difference in shading agents? 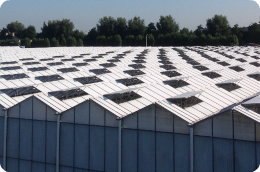 Every crop and greenhouse has different needs and therefore requires a different approach. 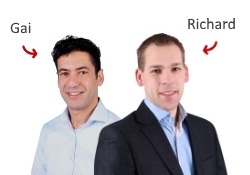 Product specialists Richard Hagedoorn and Gai Vegter would be happy to provide personal advise to suit the needs of your crop and greenhouse. Click here to contact our shading & coating specialists, or fill in the form below and we'll respond within 24 hours on working days. - What is a shading agent? - What are the differences between shading agents & coatings?